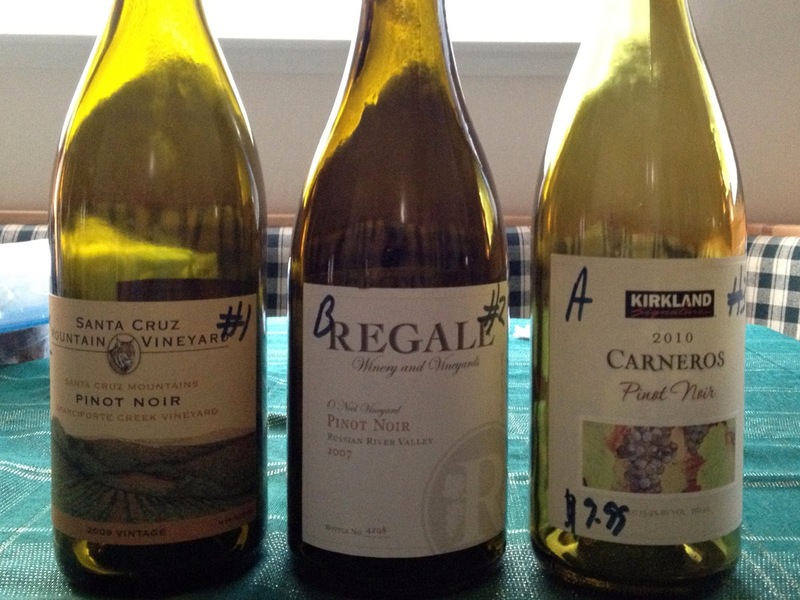 We had a wonderful wine filled BBQ for the fourth joined by Jose, Carlos, and Craig. 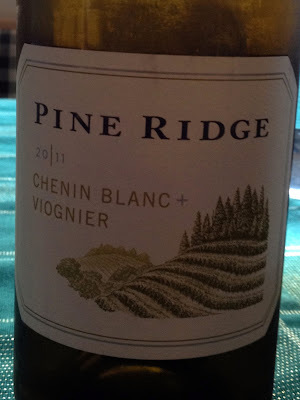 We started with an inexpensive bottle of white Paul had been recommending: 2011 Pine Ridge Chenin Blanc-Viognier. I found it at KnL for $10.99. The first taste was unfamiliar, but I quickly warmed up to it. Everyone agreed it was quite nice. Continuing my Reverse Wine Snob inspired inexpensive tasting spree, we moved to an intimate blind tasting of Pinots that included the Kirkland brand and two unknowns that I had picked up at Santa Cruz Mountains wineries. I pulled out more glasses. We tried each of them, comparing notes, and talking about this and that. 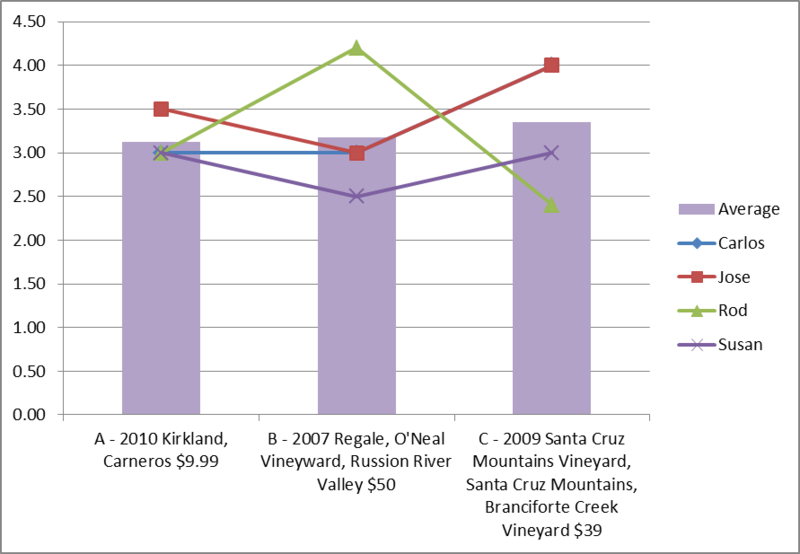 C - 2009 Santa Cruz Mountain Vineyard, Santa Cruz Mountains, Branciforte Creek Vineyard came in first place with an average of 3.35. Sue and I picked this up at the winery the last time we were there. It cost $39. This wine was darker than the others and had an aroma of cured meats. Yum! Unfortunately, I didn't enjoy the taste. I thought it was very rough, but it was everyone else's favorite. Jose thought this wine reminded him of the Picchetti. B - 2007 Regale, O'Neal Vineyward, Russion River Valley came in second place with an average of 3.18. Sue and I also picked this up at the winery the last time we were there . It cost $50. Jose claimed this wine had the Pinot aftertaste, whatever that is. 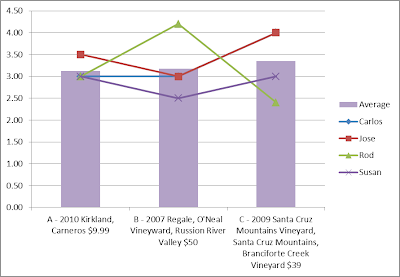 A - 2010 Kirkland, Carneros came in last place with an average of 3.13. I picked this up at Costco. It cost $9.99. When I picked it up a friendly Costco patron told me she thought that it was pretty expensive for a Kirkland brand and I should try the ménage à trois. This wine had a very light aroma and tasted like medicine. The others disagreed, giving it a likable rating. 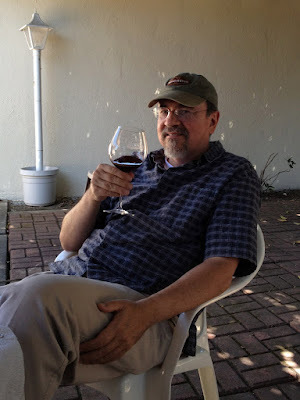 As it opened up, I settled on rating this a 3 too, giving it the nod over C.
This is the second blind tasting the Branciforte Creek Vineyard has won (see other tasting). There must be something there, but it doesn't work for me. Sue served us huge New York strip steaks, accompanied by shrimp, corn bread, corn on the cob, and my mother's cheesy potatoes. Does life get any better? 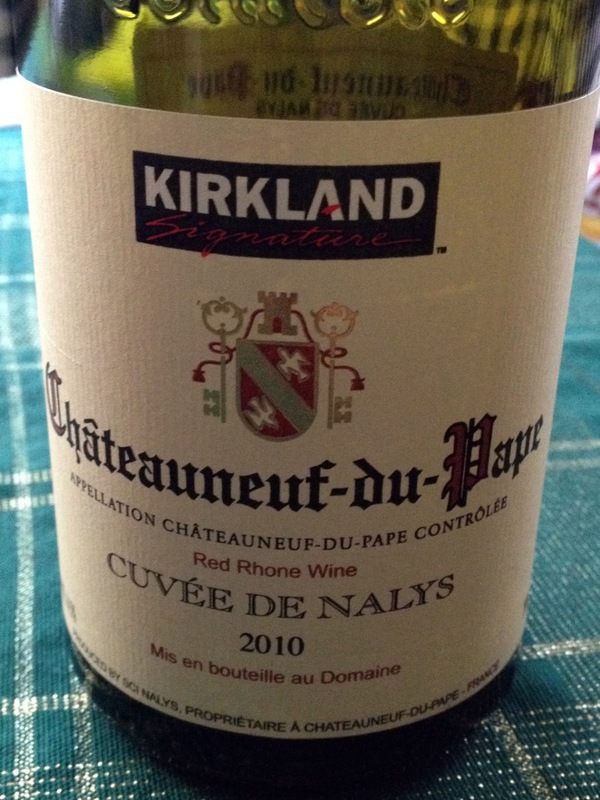 To finish the evening, I brought out the 2010 Châteauneuf-du-Pape I had also pickup at Costco. It cost $19.99; one can only image what the friendly patron would have thought of this price. I couldn't believe there was a Kirkland French wine. I wonder what the French think? I found the bottle mediocre, though no obvious flaws; decent, but nothing special. Were I Robert Parker, I would have rated it high 80s. At 8:30 we headed off to enjoy the fireworks from the mall garage roof.